A superbly located Ground Floor Apartment within a purpose built Development positioned on one of Hale's 'Tree Roads', available on either a shared equity basis which is ideal for a first fime buyer, from 35% at £92,750 or available at 100% purchase at £265,000. 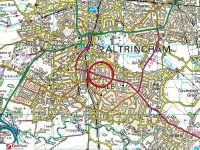 The property is within walking distance of Hale village with its range of fashionable shops, eateries and bars as well as Altrincham town centre, the popular Market Quarter, Metrolink and train station. The open green space, duck pond, tennis courts and playground of Stamford Park are on the doorstep as well as Stamford Park School. 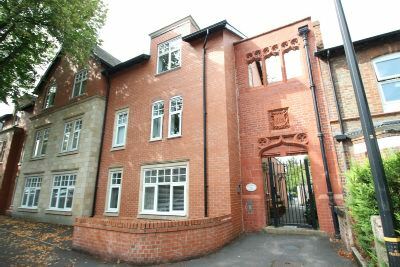 With its location and good proportions, this Ground Floor Apartment is equally suitable for a buyer looking to downsize or a first time buyer looking for an entry point onto the Hale property market, particularly with its shared equity option. The Apartment benefits from its own Front Door which opens directly off the Development's Private Outdoor Walkway, as opposed to a front door accessed off an internal communal hallway more commonly found with Apartment living. The interior provides a welcoming Open Plan Living Room and Dining Kitchen. Included with the Kitchen's extensive range of cabinetry is an integrated oven, grill, hob, extractor fan and tall fridge freezer. An Inner Hall gives access to two large storage cupboards, Bathroom, One Double Bedroom and One Large Single Bedroom. The spacious Bathroom is fitted with a white suite and chrome fixtures including a shower over the bath. Externally, the communal approach to the Apartment has been adapted by the current owners to create an Outdoor Sitting Space immediately adjacent to the front door. 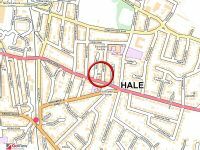 To the rear of the Development there is a covered bike store, grassed area and Car Park, accessed via Peel Avenue off Hale Road. The Apartment comes with One Allocated Car Parking Space. A lovely Apartment in a great location and available to purchase from 35% shared equity at £92,750, up to 100% share at £265,000. Further details are available on request as a shared equity purchase would involve an element of rent payment. 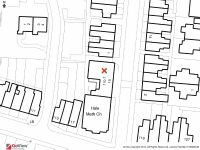 The current sellers own the property on a 35% shared equity basis, paying a rent of £246,54 per month. Offered for sale with NO CHAIN!